BT Group is to launch a pioneering internet phone service that allows users to switch between mobile networks and fixed-lines using a single handset. The service, called BT Fusion, uses a specially-equipped mobile phone to access BT's fixed-line network when making calls at home or in the office. On the move the hybrid service will connect to Vodafone's wireless network. 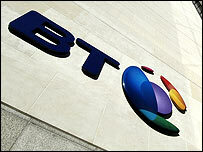 BT hopes that the service will counter both mobile networks and start-ups offering cheap internet telephony. The company said BT Fusion would combine the convenience of a mobile phone with lower fixed-line prices. Customers subscribing to BT Fusion will receive a clamshell Motorola v560 mobile handset. An access point installed in the home, called a BT Hub, will switch the mobile phone to a broadband line using Bluetooth wireless technology. BT has been focusing on broadband technology recently in a bid to offset a decline in its traditional fixed-line services. Analysts at consultants Ovum described BT's new service as an industry "watershed". "The separate fixed and mobile telephony services are no longer discrete but are intertwined. It is not overstating the case to say that the industry will never be the same again," Ovum said. However, investors were less sanguine about the offer. Shares in BT Group were down more than 1.5% at 219 pence in late trade on the London Stock Exchange. The UK's dominant fixed-line telecoms provider said BT Fusion would enable customers to make calls to UK landlines at its off-peak landline rate of 5.5 pence for up to an hour, and 3p a minute at peak hours. "For the first time customers will be able to get the best of both worlds in one service, combining the convenience and features of a mobile with fixed-line prices and quality," said BT Retail boss Ian Livingston. The BT hub also works as a wireless router, providing users access to PCs, laptops and games consoles wirelessly around the home. BT said customers joining the service would need a BT telephone line and a subscription to BT Broadband. The service will be trialed on 400 users before being more fully rolled out in September. The company said BT Fusion would be offered in two price plans of £9.99 and £14.99 a month.